Home / Uncategorized / IR35. What Next For IT? Private Sector pain? IR35. What Next For IT? Private Sector pain? IT Projects. Do We Actually Ever Learn Lessons Learnt? Where does an IT Project Manager’s job end? 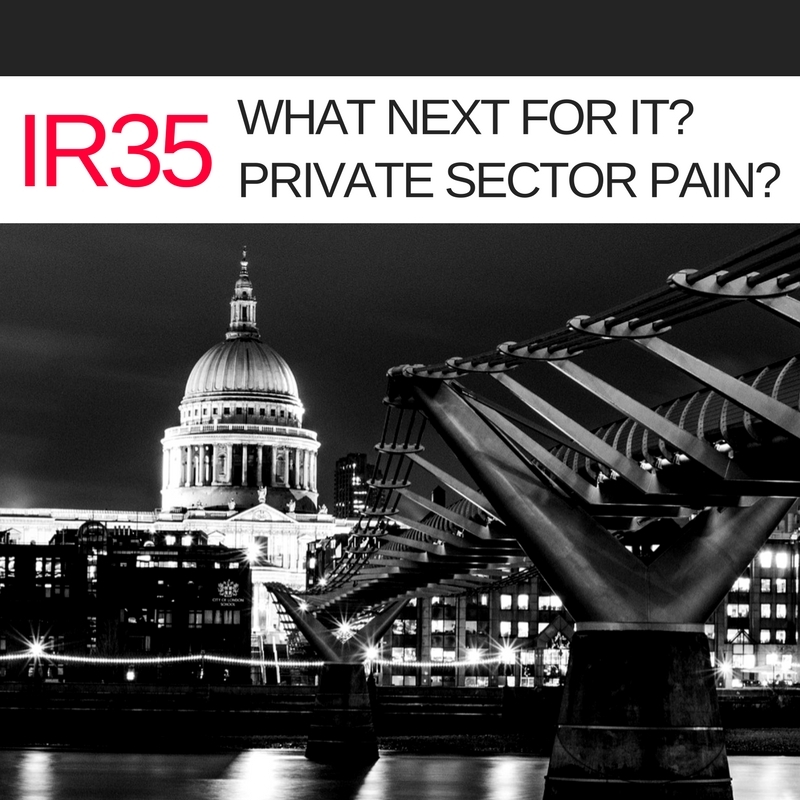 If you have had anything to do with Public Sector IT procurement over the past two years or so, either as a client or a contractor, IR35 has probably never been far from your mind. That does sound quite TIR35OME! The fact is that IR35 ‘off payroll” legislation shook up Public Sector IT service procurement. We also said that client organisations and contractors alike had to act to be prepared for the April 2017 implementation. Some did, some didn’t. As a result, some suffered greater pain than others. There has been something of a collective sigh of relief from many in the IT sector over fears that the government would extend the new IR35 ‘off payroll’ rules … but those sighs may be short-lived. Although it was not explicitly outlined in the last Budget speech, other documents released on the same day mentioned the possible extension of the rules for personal service companies in the Public Sector to workers in the Private Sector. I believe that the government has effectively shown its hand, and will consult in 2018 on how to tackle ‘non-compliance’ with the intermediaries’ legislation in the Private Sector. Our own businesses give us a unique vantage point from which to observe and comment. Stoneseed provides Project resources into both the Public Sector (where the new rules apply) and the Private Sector (where they don’t). Also, while we favour the use of our own employed resource (where IR35 becomes irrelevant), we also work with a number of Personal Service Companies (where it is highly relevant). Stoneseed’s sister company, IT recruitment specialist Access Talent, is in regular contact with many influential IT HR leaders who are feeding a constant sense of the mood music of the industry. It allows us to speculate with some confidence and authority on what will happen further down the line. To get a sense of what the Private Sector can expect, let’s leverage hindsight to give us some foresight and reflect on the impact of IR35 on the Public Sector. Recent research by APSCo found that the Public Sector is suffering the consequences of the new IR35 rules, with almost three-quarters of recruiters (70%) finding contract placements in the sector have dropped since April 2017. Almost half (45%) report increasing charge rates for contractors. On the face of it, that’s a dramatic change but the truth is, we don’t really know yet what the real fall in resourcing looks like yet. We suspect that the impact on the Public Sector, whilst significant, was not quite the predicted apocalypse. A number of factors have effectively softened the blow, and there may be key lessons here for the Private Sector. 1 – Some Public Sector organisations have planned ahead very effectively, and turned to alternative resource models. They may have increased internal staff headcount, or accessed talent through the “as a Service” markets with partners who can provide employed (ie. PAYE) staff. The thing is – they did something – they acted positively – and it worked. 2 – Many PSCs have understandably taken the view that the new rules have swung the pendulum too far the other way, and now they have the worst of both worlds. They are taxed as an employee but without the benefits and the employment rights. However, for some (and this depends very much on circumstance) the tax maths have not been quite so dramatic. The restructure of tax rules on dividends have meant that the increase in their tax burden is not as significant as it once was. They have absorbed the cost and moved their contract to Umbrella Terms. 3 – Some have renegotiated terms. They have adopted variations on the above themes and brokered compromise arrangements, such as a slight increase on day rates to compensate for the increased tax burden. 4 – Many PSCs with a highly prized skill set have increased their rates significantly, keeping their take-home pay at the same level – ironically the Public Sector have footed the bill for these increases. 5 – Many have taken the IR35 Test and adapted. They have used HMRC’s online tool to effectively take themselves out of the scope of the new rules, naming substitute workers, working to a clear Statement of work with defined deliverables etc. 6 – Many contractors took themselves out of the equation altogether by moving their skills to the Private Sector. For many, this is a case of balancing risk. We don’t really know, at this stage, how aggressively HMRC are going to challenge PSCs, but certainly, given the requirement for intermediaries to report back to HMRC on off-payroll workers, they now have the information at their fingertips. So some lessons, but the burning question for many is – will the rules be extended to the Private Sector? It’s a pretty clear statement of intent, isn’t it. I think the question is probably easier to answer in reverse … Why wouldn’t they extend it to the Private Sector? One thing I have learnt about tax is that, although it can be incredibly complicated, it is (in the main) pretty logical. I fail to see any logic in applying one rule in the Public Sector, and then not applying it to the Private Sector. The new rules have worked … kind of … or at least they haven’t failed! 1 – Increased basic and higher rate tax bands (unless you work in Scotland!) thereby reducing the amount of tax paid on PAYE income. 2 – Effectively taken away the tax-free basic rate band on dividends (replacing with a £5k allowance), the preferred mechanism for most Company Shareholders to reduce their tax burden, whilst still paying Corporation tax on company profit. 3 – Effectively narrowed the tax gap between contract and permanent workers. Contractors will often still pay less tax, but there is now at least a debate to be had once you throw in some of the benefits of sickness pay, paid holiday, pension etc. By extending the legislation to Private Sector workers the government could fast-track this process, and potentially (some would argue) level the playing field. Furthermore and, as alluded to earlier, by introducing it into the Public Sector there has undoubtedly been a leaking of skills into the Private Sector. Why wouldn’t HMRC seek to plug this leak? It’s quite clear what this means for the Personal Services Companies, but what does it mean for the engaging clients? Well disruption, for one thing, an increase in day rates and undoubtedly a need to review current resourcing models. This could be only 15 months away. You could have just five business quarters to prepare. How quickly does that time go?! If we are to learn anything from the Public Sector experience it should be that now is the time to start preparing. Begin looking at your Project Portfolios for 2019, and how these will be resourced. Will you be ready for a hike in costs …? … or are there other delivery models that might provide the answer?